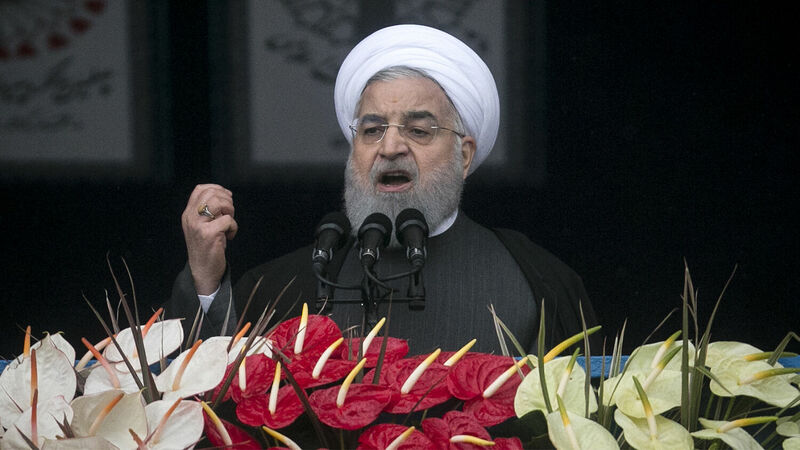 Iranian President Hassan Rouhani speaks during the 40th anniversary celebrations of the Islamic Revolution at Azadi Square in Tehran on February 11. The West has somehow become used to living with Iran as the planet’s worst state sponsor of terror, with an ambition for nuclear weapons. Forty years ago this month, the shah of Iran’s government collapsed. This is what opened the door for Ayatollah Ruhollah Khomeini to impose Islamic rule over the Iranian people. Ever since, Iranians have lived under a regime of intolerance and fanaticism, a national government that uses its people’s resources to fund terrorism. Over the decades, Iran has remained the world’s largest state sponsor of terrorism, and it is proud of it! 1979 marked a dramatic turning point for the Iranian people. The Islamic revolution embarrassed America and propelled Iran into the radical Islamist state it is today. Today, almost everyone recognizes that: politicians, journalists, average people. However, that is not how this revolution was reported at the time. Many Western nations, and especially Western journalists, welcomed the ayatollah’s return to Iran and the downfall of the shah. Shah Mohammed Reza Pahlavi had led Iran for more than 30 years. He was a strong ally of the United States, and his economic, social and political reforms aimed to modernize Iran and propel it forward as a global power. In 1963, the shah launched his ambitious “White Revolution” plan—a far-reaching government program concentrated on infrastructure development, expanding women’s rights, and combatting widespread illiteracy in the country. But these ambitious goals did not sit well with the traditional Islamist elites. They saw the shah’s reforms as the westernization of Iran. The religious sphere, led by Khomeini, a Shiite cleric, mounted a strong opposition against the shah with the objective of overthrowing his government completely. The political unrest rapidly turned into a full-scale revolution, and the shah fled on Jan. 16, 1979. Did you know that, at the time, Ruhollah Khomeini promised reforms: minority rights, equality for women, and more? A lot of Western elites openly wondered if Khomeini might be a better alternative! Khomeini’s promises brought him additional support—and time to consolidate his power. [D]epiction of Khomeini as fanatical, reactionary and the bearer of crude prejudices seems certainly and happily false …. [He] may yet provide us with a desperately needed model of humane government for a Third World country. History has proved that to be astoundingly wrong! Yet back then, there were millions of Westerners who thought like Falk. It wasn’t just professors and journalists and publishers who got it wrong. The United States government also got it wrong. The U.S. decided the shah’s rule was too “undemocratic” and provided him with little support. The administration of President Jimmy Carter could hardly have damaged the shah more. Islamists like Khomeini hated the shah for supporting the U.S., and yet the U.S. effectively sided with the Islamists against the shah! Without America’s backing, the shah stood little chance in Iran. He fled to Egypt, where he was welcomed by President Anwar Sadat. Already battling cancer, the shah moved from country to country before dying the following July. The ayatollah had returned to Iran from exile on Feb. 1, 1979, and the revolution was over on February 11. Forty years ago today was the beginning of the so-called Islamic Republic of Iran. The fruits of America’s detrimental mistake to help oust the shah became evident as soon as Khomeini had power in his hands. He used it to establish Iran as the world’s number one state sponsor of terrorism. This was not the democracy the U.S. had in mind. In early 1979, Western journalists were debating the merits of the shah’s reforms versus those promised by the ayatollah. They never saw the oppression, intolerance, humiliation, hostility and terrorism coming. Now, in early 2019, the West has somehow become used to living with Iran as the planet’s worst state sponsor of terror, with an ambition for nuclear weapons. What is about to happen next, they just don’t see coming. But you can read all about it in the prophecies of the Bible. The Bible specifically mentions radical Islam, as led by Iran, and what it will do in the 21st century. Its prophecies are shockingly detailed, and you can learn where they are, what they mean, and how they will unfold with my father’s free booklet The King of the South. He first identified radical Islam, as led by Iran, as the possible fulfillment of these prophecies in 1992, and the more time that passes, the more amazing, accurate and ahead of its time that identification proves to be. Please reply to this e-mail or click this link to request your free copy of The King of the South, by Gerald Flurry.